We May All Need Some Prozac Before This Is Over! 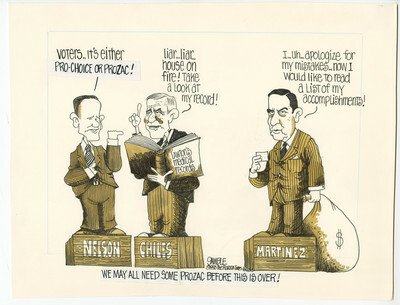 Nelson: "Voters...it's either Pro-Choice or Prozac!" Chiles: "Liar...liar...house on fire! Take a look at my record!" Martinez: “I...uh...apologize for my mistakes...now I would like to read a list of my accomplishments!" An editorial cartoon by Ed Gamble, the cartoon references gubernatorial candidates Bill Nelson, Lawton Chiles and Bob Martinez.